Gospel Shaped Church is a new curriculum based on the five characteristics of gospel ministry that lie at the heart of The Gospel Coalition that will help whole congregations pause and think carefully and prayerfully about the kind of church they are called to be. This seven-week whole-church resource explores what it means to be a counter-cultural community that lives as a light in the darkness. This Leader’s Kit contains everything you need to evaluate, plan, promote and run an engaging and immersive program with your church. 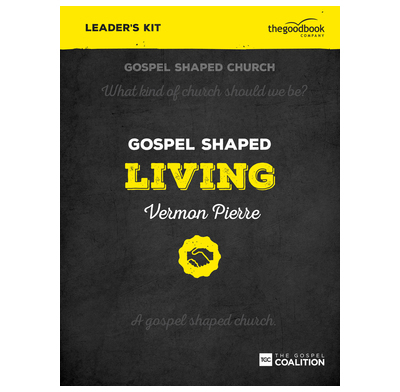 Inside the Leader Kit box you will find a copy of the Leader's Guide, a copy of the Member's Handbook and a copy of the DVD containing seven teaching sessions presented by Vermon Pierre (running time: 140 minutes). Please note, this DVD is available in NTSC format only (All modern DVD players play NTSC in the UK). Additional copies of the Gospel Shaped Living Handbook and the Leader's Guide are available.